Ridiculous rumour of the month - Alexis Sanchez from Arsenal to Chelsea. The Mirror's mock-up of the reported dream partnership for Antonio Conte. According to reports, Antonio Conte and Chelsea are watching developments with the current contract stand-off between Alexis Sanchez and Arsenal with an interest in the Chilean attacker. I have to say it straight away here, I think this is total rubbish and 100% complete and utter fabrication by the Press who seem to have been fed a line from the players representatives and have jumped all over it. The Mirror broke the news late on Wednesday night that Alexis Sanchez is not happy with Arsenal because he ONLY earns £130,000 per week on his existing contract which has just 18-months left to run. As a result, Chelsea are reportedly watching developments between the two as apparently, Antonio Conte sees Diego Costa and Sanchez as his dream partnership up front. Now Arsenal being Arsenal with their strict pay structure are refusing to budge at this stage after being told by the players "representatives" that he has been offered around £400,000 per week to go to China. It's believed that they are looking for a similar deal in Europe rather than move to the Far East. Arsenal will continue to refuse to negotiate until the summer at the earliest. I personally think this report is total nonsense for two reasons. 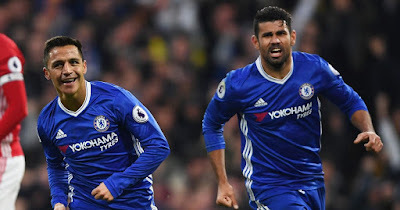 Firstly, no player on the planet is worth that amount of money and if a club in China is willing to pay someone that much then I cannot see them staying here unless like Oscar and Cesc Fabregas, you take pride in your football and their love of the game overrides any financial reward. It's ridiculous to think that his representatives think that they can force Arsenal into paying silly money to keep him. Why on earth would they be willing to more than treble his salary? Do we think that Chelsea would be willing to do so? Secondly, I just don't think that Arsenal would be willing to do business with Chelsea at all if the player decides that he wants to leave. None of the top four rivals want to strengthen their direct rivals and it's not as if Arsenal need the money is it. It's my view that these so-called representatives are trying to line their own pockets and take as much as they can themselves so they put these stories out there to try and destabilise clubs and their players. Alexis Sanchez is a class act and would be someone I would love to sign but this isn't going to happen.